The next version of Office software will be commercially available on Tuesday, January 29, according to ZDNet's Mary Jo Foley. Microsoft hasn't announced an official release date, but the company has already started teasing the launch of Office 365, a subscription version of its productivity software, for January 29. Also, a post on Microsoft's Office Twitter account hints at a launch event on January 29 in New York City. 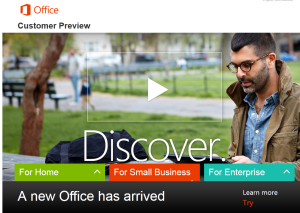 Office 2013 sports a new look, in line with the “Modern-style” aesthetic of Windows 8. Although the software still runs on the desktop, Microsoft has included a “Touch Mode” that makes Office easier to use on Windows 8 tablets. improvements in Office 2013 include a new “Read Mode” in Word for viewing documents without distractions, built-in PDF editing, additional analysis tools in Excel and tighter integration with Web services such as SkyDrive and Facebook. Microsoft Office 2013 will cost $140 for the Home & Student Edition with Word, Excel, PowerPoint and OneNote. A Home & Business edition, which includes Outlook, costs $220, and a Professional edition with Publisher and Access costs $400. Microsoft is making a big shift this year by packaging Office software within a subscription service that integrates with Microsoft's online tools. That cloud-and-desktop package, called Office 365, provides up-to-date versions of Office for up to five devices. A Home Premium subscription costs $100 per year and includes 20 GB of SkyDrive storage and 60 minutes per month of Skype calls. For all users, Microsoft also offers Office Web Apps, pared down editions of Word, Excel, PowerPoint and Outlook that run in a browser. The major desktop Office 2013 applications have been available for consumers to test drive for the past seven months. For a full rundown on what's new in Microsoft's productivity suite, check out our review of Office 2013.